Now Lets Get to the Chapter!. The Regionals are going to be soon!. And Chrono will soon become a Grade 3 Fighter (only Grade 3 fighters can participate). So now Kamui informs him that he needs one thing to be complete. Form a Team of three People!. And Why? Chrono Asks, well... Who knows?. But Kamui explains him that instead of complaining, it would be better that he start finding some Comrades. Meanwhile Shion is having a fight in that super elegant Shop. That Guy, Komachi, asks him if Shion wants to be in his Team, Which Shion Refuses. In Another Part Tokoha and Aki are eating some bread, they talk about gaining weight, but then the conversation goes to the Regionals, in which Tokoha decided to Participate. She was asked by a bunch of Bisghoujo Pretty Boys who looks like they want more than a Team, and some Girls who looked like their intentions were to use her as a Bridge to get to her Brother. Anyway, she ask Aki if she form a team with her, but Aki says that Yes!...The Next year, since she is still a Grade 1 Fighter. Chrono For His Part is asking a bunch of guys...And failing epicly at it. It Looks Like the only people he is liked is by litle kids. A litle after that Tokoha enters and so does Shion, it looks like Kamui called them over. He say to them, and Chrono, that the Three of them should make a Team. Thei Chemistry!, their Hability!, their Passion!, the fact that the three of them are the Main Characters...Ah Well... Scratch that (don´t). Anyway, the three of them refuses at first. But Kamui say a big truth, that both Shion and Tokoha has received a bunch of invitations, and has said no to all of them...And with Chrono, well he just can´t get a bone in that regard. And Well Kamui just feels it in his hearth!. So yeah...the three of them will give it a shot. So now the three of them are at the park, alongside Kamui who looks like he is only trolling them. I mean he putted them some Physical Education Uniforms and all. So Now is the "Training" Part!. The First Training is a Three Person Three legged Race!. Or Something, Both Shion and Chrono are red as a Tomato because they will have a physical contact with a Girl, meanwhile Tokoha is pretty cool with it, but she is trying to organize everything. 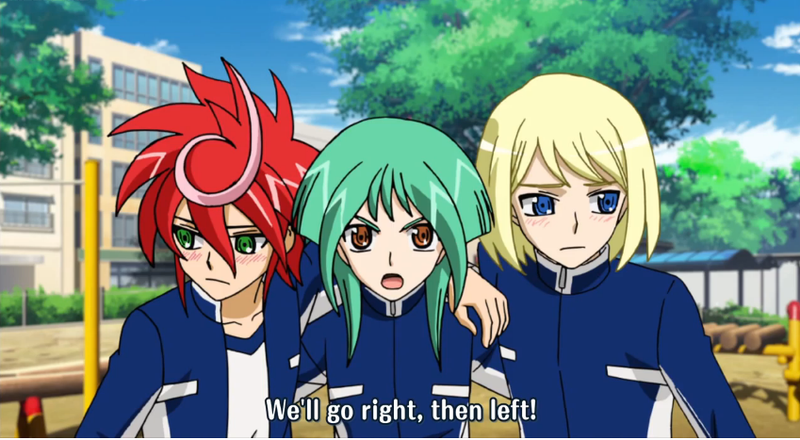 And they fail misserably at it, the three of them argue about whats right and left means it meaned Chronos Right?, or Tokoha?, maybe Shion?. Any Way. Time for the second test!. Now is Group Gymnastic!. And Again fail horribly!, also Chrono said that Tokoha Weights more thn she Looks like. Bad Chrono!, don´t you see the people are Shiping the Chronoha Pairing?!. The next is a series of Questions and the three of them will have to answer it at the same time, in hopes that they got the same answer. They didn´t do it that right either. And the last one is fishing, Oh Look!, Shion got one!...And for some reason they failed. After that the Team was angry at Kamui, first because that last test was impossible!, and Second, what does all of this have todo with playing Cards?!. Shion says that he has confidence in his hability at playing cards. So in that case they will face another Team, the Trinity Dragon Team, Our three Heroes are confident since they always beat those guys anyway, So what can go wrong?...And f course, there is a catch. Both Teams will participate in a fight were they wil be changing the fighter each turn. So Now is the Team Trinity Dragon Vs...Ah... Whats their name?. Ou... Okay (Lol) anyway, after some mocking for that name, Both teams, Team Trinity Dragn and Still Unnamed will go to the action!. And they made the first move!...And then change. Indeed Chrono, anyway The Trinity Dragon Team is kicking the collective asses of the Still Unnamed Team!. While them are facing some serious troubles since their fight styles are so different from each other. And their arguing keeps going and going. Meanwhile the Trinity Dragon team is fighting like a One Unit. Also Shion is telling us how the people is playing Vanguard nowadays. That its better to protect first in the early turns and then later you will draw more cards that are the bread and butter of your deck strategy, ergo he is reducing the filler in order to bring the true necessary cards (which is a smart move in the TCG in general)... Wait now hearing him again, i didn´t truly understanded it, oh well :P, at the very least i said a good advice to any TCG Fighter out there... Right?, Right. Anyway, the Trinity dragon is in some problems, they have 5 damage and only one card in his hand!, but they still trusth and respect each other!, so they will be fine. And they release their fourth grade card, Kirin!.And put the Team Still Unnamed against the ropes!. And Shion tries to end this too. The three of them are arguing a lot!. And then Shion takes take out of the bag and said it, that Kamui is only trolling them since Chrono is still a Grade 2 Fighter, so from the start he can´t go to the Regionals. So this team is truly fake, and althoug he knew that, he still joined it because he felt something diferent from when other firhters asked him to Join, and a similar case is also for Tokoha. And the Trinity Dragon team bring other 4th Grade Card!. And won!, the Trinity Dragon team won!!. The three of them compliment each other, that this was not a personnal win, but a team win. Kamui then speaks that he is dissapointed with the Team Still Unnamed, that all of those things about chemistry and that they can reach to the top were only Illussions, and that the truth is that they have Zero chance to go anywhere. Also he ordered them to go home, brush their teeth and go to bed. And of course that awaken their jerk sense and decided to form a Team!, The Power or reverse Psychology is awesome!. And after that they started arguing again...Something never change, huh?. It was an Awesome episode!, it was truly great!, their interactions were good and the fight was also very entertaining, i liked how Chrono, Shion and Tokoha are being developed!. Also, now we have them as a Team!, so now is time to see how they will act now as an official team and see how Chrono gets to be a Grade 3 Fighter. Also Trinity Dragon Won!. So thats something. Anyway, my two cents. So See you next Time!.